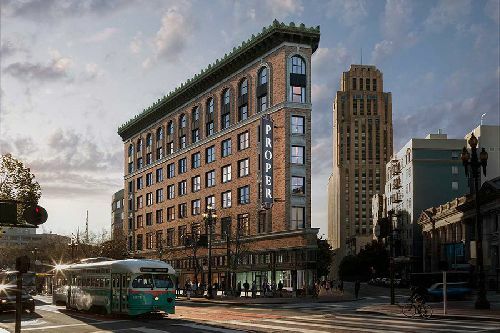 The Kor Group has obtained a $45 mil refi loan on the 131-room San Francisco Proper Hotel, located in the heart of the city’s vibrant Mid-Market neighborhood. The Proper Hotel is located at 1100 Market St, a few blocks southwest of Union Square. The financing was arranged by Malcolm Davies, Evan Kinne, Zack Streit, Rachael Lewis, Alexander Rossinsky and Minjoo Kim with George Smith Partners. The firm previously worked with The Kor Group, out of Los Angeles, to arrange financing for the historic flatiron building at the triangle of McAllister, Market and Seventh Street. San Francisco Proper Hotel is located in the heart of the city, within walking distance of major landmarks, cultural institutions, architectural marvels, cutting-edge tech companies, and more. Designed by international tastemaker Kelly Wearstler, the hotel offers iconic interiors inspired by the city’s pre-modernist European influence, providing a luxurious yet residential feel. The hotel is host to two award-winning food and beverage concepts, including Villon, an all-day dining destination, and Charmaine’s, a rooftop bar boasting 360 degree views of the city, and offers a multitude of first-class amenities, including Bellino linens, Aesop bath and body products, Vifa speakers, Aireloom mattresses, and 24/7 room service.